Ten years ago today, a little website called thefacebook.com was launched. Initially restricted to Harvard undergraduates, the site had 1 million users by the end of 2004. Today, Facebook (“the” was dropped in 2005) has more than 1.2 billion “monthly active users” around the world. As of December, the company says 757 million people used the social-networking service on any given day. These days, Facebook’s strongest growth is coming from overseas. The monthly user base (defined as those who accessed the site at least once in the previous 30 days) grew just 4.1% in the U.S. and Canada last year, according to the company’s annual 10-K report. In Europe, it grew by 8%; in Asia, 23.5% (including Australia and New Zealand); and in the rest of the world, it grew by 23.7%. 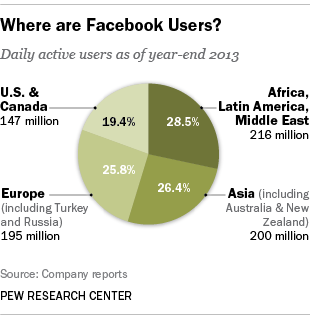 American and Canadian users, in fact, now make up less than a sixth of Facebook’s total user base. The rapid rise in users engaging with Facebook via smartphones, tablets and other mobile devices poses another challenge. In December, the company reported, 945 million monthly active users worldwide accessed Facebook via a mobile application or a mobile version of the site, up 39% from December 2012. 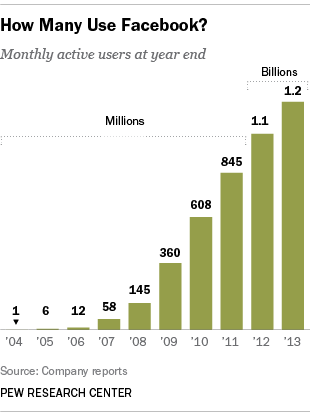 Of those 945 million, nearly a third (296 million) were mobile-only users.